A recording of me speaking at MongoNYC 2012. My next talk is at GoRuCo, the Gotham Ruby Conference. We’ll take a Grape API from zero to cache in 10 minutes. The lineup of speakers is pretty intimidating, ranging from Dr. Nic Williams to David Chelimsky. 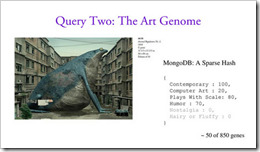 MongoNYC 2012: Using MongoDB to Build Art.sy - Video was published on June 03, 2012 . See a typo?